May 19, 2015 (New York, NY) – It was an exciting week for our customers last week in Nashville, TN, where SiriusDecisions hosted its annual Summit. 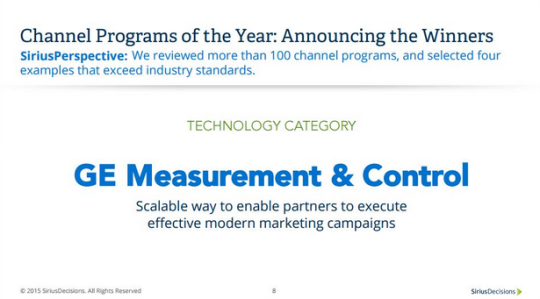 Two StructuredWeb customers, General Electric Measurement & Control and Cisco Distribution Marketing both received prestigious Channel Program of the Year awards. This award was given to 4 select vendors whose channel program initiatives from the previous year yielded significant gains in either partner adoption, lead generation, or partner recruiting. Winners from 2015 included GE Measurement & Control (Partner marketing concierge), Cisco Distribution Marketing (Distributor marketing Concierge), Dassault Systemes (partner adoption of social marketing), and Rackspace (partner recruiting). Both GE and Cisco are StructuredWeb customers, and although each program was very different in scope, both saw measurable results from their program that caught the eyes of the SiriusDecisions analysts. Read below for an overview of each program and for the critical success factors that earned each program this recognition. 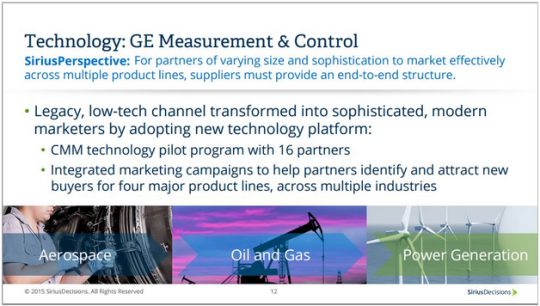 General Electric Measurement & Control, a product division within GE Oil & Gas, was at a critical juncture. Building on a century of success and the outstanding reputation of GE, this division had grown a powerful worldwide channel partner network of over 1200. One major objective for GE was to learn how to better enable these partners with digital marketing in a low-tech manufacturing focused market. Existing challenges: Most of these partners were small businesses, some even just a single manufacturer rep, and they were struggling with the jungle that is modern day marketing. Several of these channel partners did not even have their own websites! How do you enable these channel partners to be successful marketers in a fast changing, fast moving digital world? Thankfully GE found StructuredWeb. 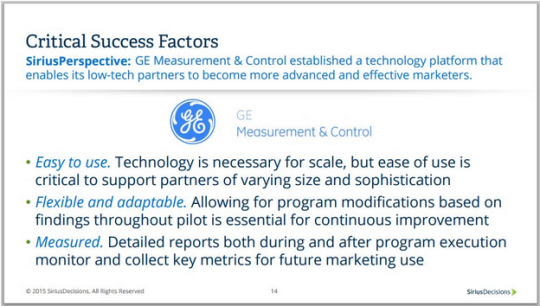 Successes: GE’s goal was to implement SiriusDecisions’ Fast Track to Demand model through its channel partner network. 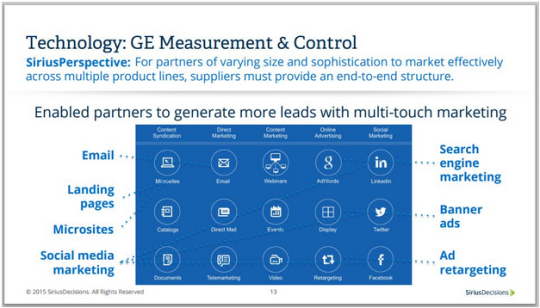 GE Measurement & Control chose 20 partners to pilot with, and within 30 days, these partners had a fully managed marketing program executed on their behalf. Every partner generated new leads through this program, some from sources they had never utilized before (social marketing, Google AdWords, Google Retargeting), and one partner created 5 new opportunities within 90 days of program launch. The pilot was a great learning experience for both GE and for the channel partners, and the program was deemed so successful that GE doubled the size of the partner base and expanded to European and Chinese markets with translated content and expanded marketing tactics being deployed on behalf of the partners. How: Successful marketing in 2015 is all about diversity and consistency: lots of different marketing tactics being executed and deployed over a lengthy period of time to touch as many points in the buyer’s journey as possible. The days of being able to send an email campaign or running an annual event to generate the majority of new leads are gone. Marketing requires an ongoing focus to remain in front of the prospect so that when they are finally ready to engage in the sales process (which could be 50-70% of their way through their exploration process), your brand and your solution are top of mind to that prospect. To accomplish this best practice B2B marketing execution for dozens of channel partners, scalability is key. StructuredWeb’s services team built each of these partners a cobranded GE product microsite, two 6-touch email nurture campaigns, social media content for LinkedIn and Twitter, and even a webinar invitation/registration/post-webinar marketing campaign. Very positive initial results have triggered an extension of focus from North America to other regions such as EMEA and Asia Pacific, with very successful campaigns being run in China specifically. GE is looking forward to extending the current programs to additional product lines and to additional global partners. For more information on how to launch your own successful marketing concierge program, contact us at StructuredWeb: michael.coscetta@structuredweb.com. Previous Previous post: Explore the impact of data across every industry and every sector. Next Next post: Cisco has seen leads jump by 431%!